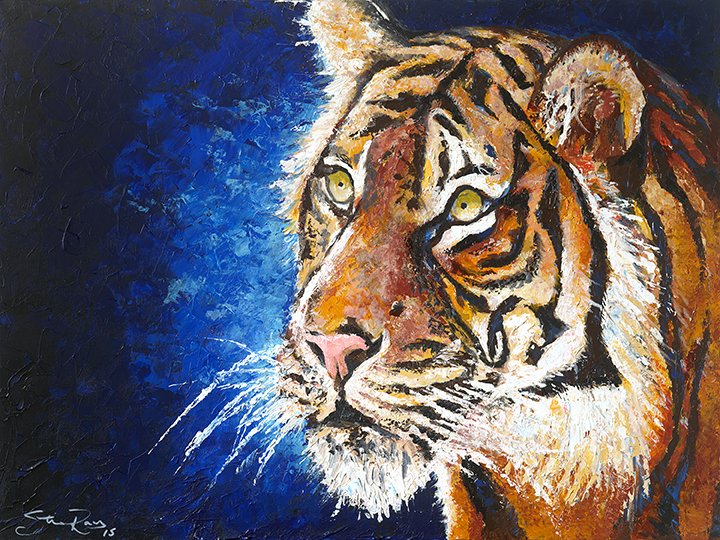 Acrylic Tiger on Canvas 36x48in. Hello my name is Stevie Slakey. I'm a portrait artist from the Bay Area, I have recently relocated to the LA area. Downey is the city that I now call home. Although the characteristics of an artist can take the appearance of many forms, it wasn't until 2011 that I began to draw with intent. I largely consider myself self-taught and initially used Dragoart (a website giving specific step by step instruction for drawing) to begin my process. My focus was driven by isolation. During those beginning stages, my living conditions were such that distance outweighed my urges to party and recklessly socialize and so art became my outlet, my passion and my main form of self-expression. This prompted my decision to register for beginning art during my Junior year of high school upon which I was blessed with an amazing teacher, Ms. Knudsen. Her teaching style and subject matter really motivated me. I began my artistic journey in a weave of styles, starting with tattoo art. Mister Cartoon is one of a few artists whose style really captivated my pencil. After the conclusion of my junior year and the hours upon hours that I dedicated to my craft, it was my thirst for knowledge and drive to improve that led me to register for AP Art the following year. This class was taught by the same teacher, Ms Knudsen and after two years of studying under her guidance, I feel like I learned so many valuable techniques that I still currently apply and a keen sense of genuine artistry. Following High School graduation I practiced art with halfheartedness and focused more on becoming a tattooist. I was informed that it was expected that I be able to complete a drawing within hours and add multiple styles to my arsenal. In hoping to improve upon the styles needed, I started completing a drawing a day and also in an attempt to remain well rounded as an artist starting doing portraits. At first, portraits were not something I enjoyed doing but somewhere along the line it became my favorite style of art and what I consider my signature work. After I got comfortable with penciling portraits I transitioned into charcoal portraits. Charcoal Has been arguably my most successful style. I started by using just regular charcoal and white paper but have recently transitioned to gray toned paper, and white charcoal as well. After becoming content with my charcoal progress I decided to expand my creativity and indulge in acrylic painting. Painting was instant love and for many reasons. First, it gives me complete freedom and the power to express myself in ways that pencil and charcoal limited. Secondly, color has the ability to affect mood. The vibes that reflect from each piece give me the power to feel, to bring personality to canvas. My preference is portrait painting and my portfolio consists of mainly musicians. The reason being is music is such a huge part of my life, in my opinion it's the most powerful art form. I've been influenced and inspired by so many musicians and so my reasoning is as follows: why not paint the very people who continue to inspire you? My inspiration isn't limited to only musicians as Im heavily influenced by artists such as Madsteez, David Kassan, Cuong Nguyen, Rembrandt, Erin Hanson, Mark Maggiori, Peter Terrin and Jean Michael Basquiat just to name a few. Now obviously this isn't a complete list of artists who inspire me but all of my pieces and the styles I use are inspired by these individuals. I treat my progression as an artist much like the views of buddhists monks who practice the art of zen. Perfection is never an obtainable feat. All that is required for progress is consistency. The day you stop learning is the day you stop breathing and even then your spirit continues to teach and inspire.